Trust and integrity are critical to the digital advertising ecosystem. Investments in our ad traffic quality systems made it possible for us to tackle this ad fraud operation and to limit the impact it had on our clients as quickly as possible, including crediting advertisers. 3ve’s focus, like many ad fraud schemes, was not a single player or system, but rather the whole advertising ecosystem. 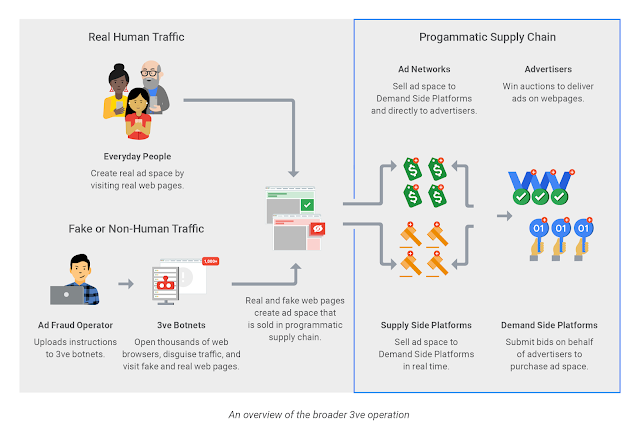 As we worked to protect our ad systems against traffic from this threat, we identified that others also had observed this traffic, and we partnered with them to help remove the threat from the ecosystem. The working group, which included nearly 20 partners, was a key component that shaped our broader investigation into 3ve, enabling us to engage directly with each other and to work towards a mutually beneficial outcome. While ad fraud traditionally has been seen as a faceless crime in which bad actors don’t face much risk of being identified or consequences for their actions, 3ve’s takedown demonstrates that there are risks and consequences to committing ad fraud. We’re confident that our collective efforts are building momentum and moving us closer to finding a resolution to this challenge. For example, industry initiatives such as the Interactive Advertising Bureau (IAB) Tech Lab’s ads.txt standard, which has experienced and continues to see very rapid adoption (over 620,000 domains have an ads.txt), as well as the increasing number of buy-side platforms and exchanges offering refunds for invalid traffic, are valuable steps towards cutting off the money flow to fraudsters. As we announced last year, we’ve made, and will continue to make investments in our automated refunds for invalid traffic, including our work with supply partners to provide advertisers with refunds for invalid traffic detected up to 30 days after monthly billing. Industry bodies such as the IAB, Trustworthy Accountability Group (TAG), Media Rating Council, and the Joint Industry Committee for Web Standards, who are serving as agents of change and collaboration across our industry, are instrumental in the fight against ad fraud. We have a long history of working with these bodies, including ongoing participation in TAG and IAB leadership and working groups, as well as our inclusion in the TAG Certified Against Fraud program. That program’s value was reinforced with the IAB’s requirement that all members need to be TAG certified by the middle of this year. A coordinated takedown of infrastructure related to 3ve’s operations occurred recently. The takedown involved disrupting as much of the related infrastructure as possible to make it hard to rebuild any of 3ve’s operations. 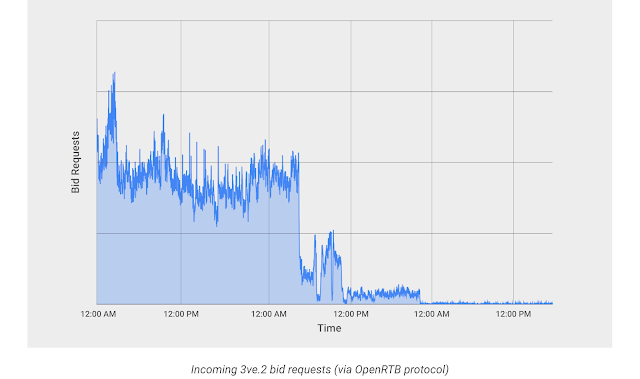 As the graph below demonstrates, declining volumes in invalid traffic indicate that the disruption thus far has been successful, bringing the bid request traffic close to zero within 18 hours of starting the coordinated takedown. We’ll continue to be vigilant, working to protect marketers, publishers, and users, while continuing to collaborate with the broader industry to safeguard the integrity of the digital advertising ecosystem that powers the open web. Our work to take down 3ve is another example of our collaboration with the broader ecosystem to improve trust in digital advertising. We are committed to helping to create a better digital advertising ecosystem — one that is more valuable, transparent, and trusted for everyone. 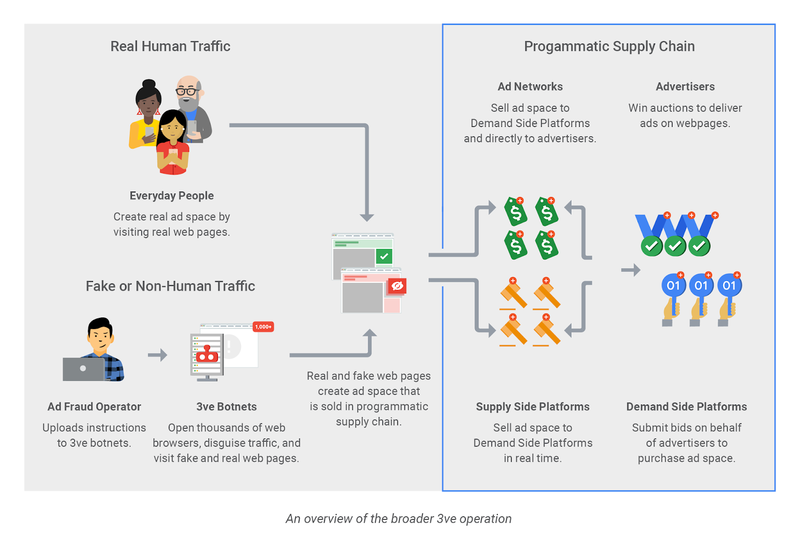 For years, Google has been waging a comprehensive, global fight against invalid traffic through a combination of technology, policy, and operations teams to protect advertisers and publishers and increase transparency throughout the advertising industry. Last year, we identified one of the most complex and sophisticated ad fraud operations we have seen to date, working with cyber security firm White Ops, and referred the case to law enforcement. Today, the U.S. Attorney’s Office for the Eastern District of New York announced criminal charges associated with this fraud operation. This takedown marks a major milestone in the industry’s fight against ad fraud, and we’re proud to have been a key contributor. In partnership with White Ops, we have published a white paper about how we identified this ad fraud operation, the steps we took to protect our clients from being impacted, and the technical work we did to detect patterns across systems in the industry. Below are some of the highlights from the white paper, which you can download here. Referred to as 3ve (pronounced “Eve”), this ad fraud operation evolved over the course of 2017 from a modest, low-level botnet into a large and sophisticated operation that used a broad set of tactics to commit ad fraud. 3ve operated on a significant scale: At its peak, it controlled over 1 million IPs from both residential malware infections and corporate IP spaces primarily in North America and Europe. Through our investigation, we discovered that 3ve was comprised of three unique sub-operations that evolved rapidly, using sophisticated tactics aimed at exploiting data centers, computers infected with malware, spoofed fraudulent domains, and fake websites. Through its varied and complex machinery, 3ve generated billions of fraudulent ad bid requests (i.e., ad spaces on web pages that advertisers can bid to purchase in an automated way), and it also created thousands of spoofed fraudulent domains. It should be noted that our analysis of ad bid requests indicated growth in activity, but not necessarily growth in transactions that would result in charges to advertisers. It’s also worth noting that 3+ billion daily ad bid requests made 3ve an extremely large ad fraud operation, but its bid request volume was only a small percentage of overall bid request volume across the industry. How Secure is Small Business Cloud Storage?